Russian cliff diver Artyom Silchenko is still searching for his first win of the season, as he failed to reach the podium at the latest stage of the world tour in France this weekend. 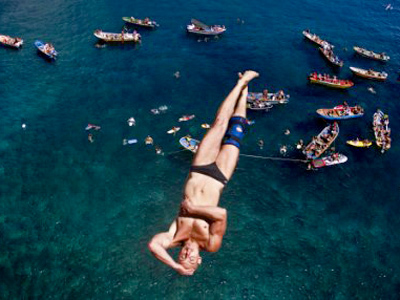 Champion Gary Hunt swooped to conquer and put himself even more clearly at the top of the 2011 standings in front of the Red Bull Cliff Diving World Series' biggest-ever crowd of 70,000 spectators in La Rochelle. The Brit top scored with 401.45 points to finish ahead of Michal Navratil, who claimed a second successive top-three finish, and Alain Kohl, who made his first appearance on a World Series podium. Perennial challenger Artyom Silchenko failed to make it to the final round after a second dive water entry mistake. The Russian is not upset, however, saying he will have a chance to rehabilitate himself next month in Italy, where the fifth stage of the 2011 World Series will be held.